Soil salinity adversely affects plant growth and development and disturbs intracellular ion homeostasis resulting cellular toxicity. The Salt Overly Sensitive 1 (SOS1) gene encodes a plasma membrane Na+/H+ antiporter that plays an important role in imparting salt stress tolerance to plants. Here, we report the cloning and characterisation of the SbSOS1 gene from Salicornia brachiata, an extreme halophyte. The SbSOS1 gene is 3774 bp long and encodes a protein of 1159 amino acids. 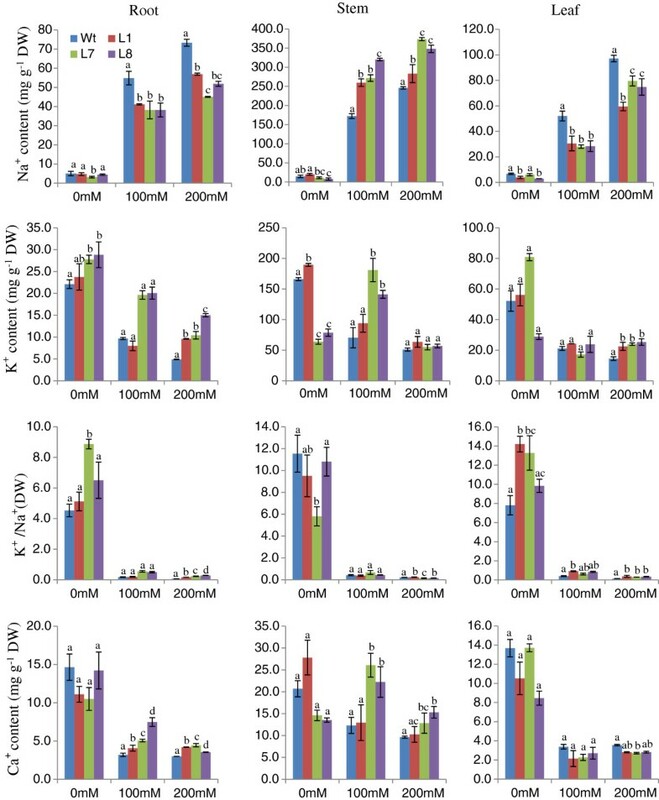 SbSOS1 exhibited a greater level of constitutive expression in roots than in shoots and was further increased by salt stress. Overexpressing the S. brachiata SbSOS1 gene in tobacco conferred high salt tolerance, promoted seed germination and increased root length, shoot length, leaf area, fresh weight, dry weight, relative water content (RWC), chlorophyll, K+/Na+ ratio, membrane stability index, soluble sugar, proline and amino acid content relative to wild type (WT) plants. 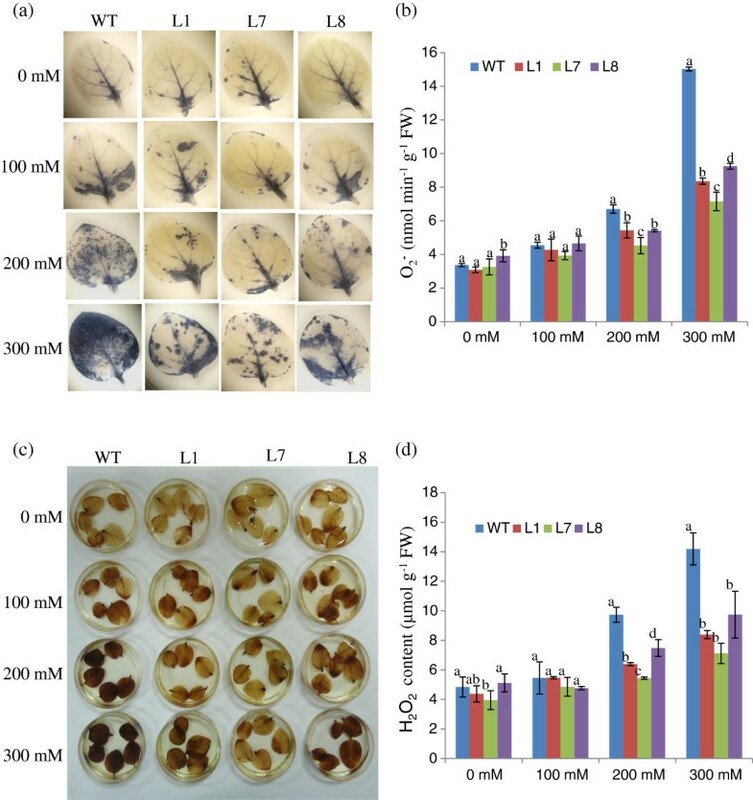 Transgenic plants exhibited reductions in electrolyte leakage, reactive oxygen species (ROS) and MDA content in response to salt stress, which probably occurred because of reduced cytosolic Na+ content and oxidative damage. 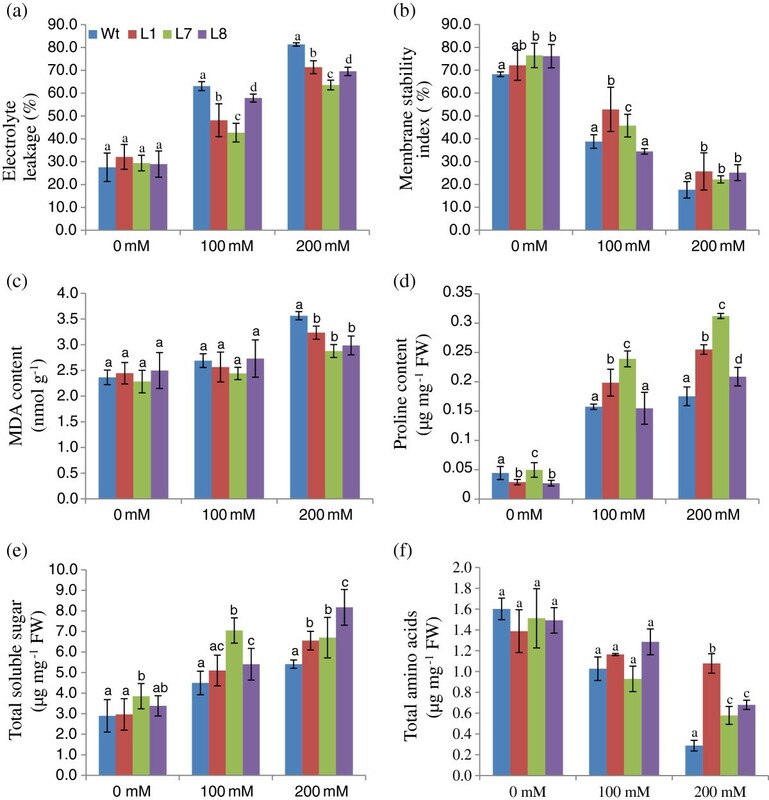 At higher salt stress, transgenic tobacco plants exhibited reduced Na+ content in root and leaf and higher concentrations in stem and xylem sap relative to WT, which suggests a role of SbSOS1 in Na+ loading to xylem from root and leaf tissues. Transgenic lines also showed increased K+ and Ca2+ content in root tissue compared to WT, which reflect that SbSOS1 indirectly affects the other transporters activity. Overexpression of SbSOS1 in tobacco conferred a high degree of salt tolerance, enhanced plant growth and altered physiological and biochemical parameters in response to salt stress. In addition to Na+ efflux outside the plasma membrane, SbSOS1 also helps to maintain variable Na+ content in different organs and also affect the other transporters activity indirectly. These results broaden the role of SbSOS1 in planta and suggest that this gene could be used to develop salt-tolerant transgenic crops. The productivity of over one-third of the arable land in the world is affected by the salinity of the soil . More than 800 million ha of land worldwide are salt-affected . High salinity adversely affects plant growth and development by disturbing intracellular ion homeostasis, which results in membrane dysfunction, attenuation of metabolic activity and secondary effects that inhibit growth and induce cell death . Nearly all enzyme activity is reduced severely at NaCl concentrations above 0.3 M because of disruption of the electrostatic forces that maintain protein structure . NaCl stress also significantly damages photosynthetic mechanisms through a combination of superoxide and H2O2-mediated oxidation . Plants adapt to environmental stresses via a plethora of responses, including the activation of molecular networks that regulate stress perception, signal transduction and the expression of both stress-related genes and metabolites. Plants have stress-specific adaptive responses as well as responses which protect the plants from more than one environmental stress . Numerous abiotic stress-related genes, as well as some transcription factors and regulatory sequences in plant promoters, have been characterised . Plants employ three different strategies to prevent and adapt to high Na+ concentrations: 1) active Na+ efflux, 2) Na+ compartmentalisation in vacuoles, and 3) Na+ influx prevention [8, 9]. Antiporters are an important group of genes that play a pivotal role in ion homeostasis in plants. Na+/H+ antiporters (NHX1 and SOS1) maintain the appropriate concentration of ions in the cytosol, thereby minimising cytotoxicity. NHX1 are located in tonoplasts and reduce cytosolic Na+ concentration by pumping in the vacuole , whereas SOS1 is localised at the plasma membrane and extrudes Na+ in apoplasts . Both of these antiporters are driven by the proton motive force generated by the H+-ATPase . The discovery of, and pioneer studies on, sos mutants in Arabidopsis uncovered a new pathway for ion homeostasis that promotes tolerance to salt stress. The sos mutants were specifically hypersensitive to high external concentrations of Na+ or Li+ and were unable to grow at low external K+ concentrations [13, 14]. The SOS pathway consists of three proteins: SOS3, a calcium sensor protein ; SOS2, a serine/threonine protein kinase ; and SOS1 . During salt stress, cellular Ca2+ levels are altered and CIPK and CBL interacting proteins are activated. Calcineurin B-like proteins (CBL) participate in salt stress-mediated signal transduction to control the influx and efflux of Na+. The calcineurin B-like (regulatory) Ca2+ sensor SOS3 (Salt overly sensitive 3) has been cloned from Arabidopsis. SOS3 interacts with and activates the serine/threonine protein kinase SOS2 [16, 19]. This interaction has been reported to recruit SOS2 to the plasma membrane where it interacts with SOS1 . The A. thaliana SOS1 gene was ectopically expressed for the first time in Arabidopsis and reduced the accumulation of Na+ in the presence of salt stress . Similar results were obtained when SOD2 and NhaA, which are plasma membrane Na+/H+ antiporters from Schizosaccharomyces pombe and Escherichia coli, respectively, were overexpressed in Arabidopsis and rice . Heterologous expression of different plant SOS1 genes suppressed the Na+ sensitivity of the yeast mutant (AXT3K) (Arabidopsis thaliana,; Arabidopsis thaliana,; Cymodocea nodosa,; Oryza sativa,; and Solanum lycopersicum,). Additionally, Wu et al. and Garciadeblas et al. showed that expression of PeSOS1 and CnSOS1 partially suppressed the salt-sensitive phenotypes of the EP432 bacterial strain (nhaA,nhaB), which lacks activity of the two Na+/H+ antiporters EcNhaA and EcNhaB. Few studies have performed in planta overexpression of the SOS1 gene from Arabidopsis[21, 29], Thellungiella and Puccinellia tenuiflora. The study of the salt tolerance mechanisms of halophytic plants has emerged as an important area because these species are well-adapted to and can overcome soil salinity more efficiently than glycophytic plants . Our lab studies an extreme halophyte, Salicornia brachiata Roxb. (Amaranthaceae), in an effort to identify and characterise novel genes that enable salt tolerance. S. brachiata, a leafless succulent annual halophyte, commonly grows in the Gujarat coastal marshes in India. Salicornia can grow in a wide range of salt concentrations (0.1–2.0 M) and can accumulate quantities of salt as high as 40% of its dry weight. This unique characteristic provides an advantage for the study of salt tolerance mechanisms. Salicornia accumulates salt in the pith region, which reflects the fact that antiporter genes are necessary to maintain homeostasis in extreme salinity. This report describes the isolation of the SbSOS1 gene from S. brachiata and overexpression in tobacco plant for functional validation. Salicornia brachiata Roxb. seeds were collected from dried plants obtained from the coastal area near Bhavnagar, Gujarat, India. The seeds were germinated in plastic pots containing garden soil and the plants were grown in natural conditions. At one month, the seedlings were carefully uprooted and transferred to hydroponic conditions (¼ major and minor MS stock) in a culture room with a dark/light cycle of 8/16 h at 25°C for one month. The plants were treated with various concentrations of NaCl (0.10, 0.25, 0.5, 1.0, 1.5, and 2.0 M) for 48 h. Upon completion of the treatments, shoot and root tissues were separately collected, frozen in liquid nitrogen and stored at −80°C. Degenerate primers were designed from conserved regions of the SOS1 gene. To identify conserved regions of the SOS1 gene for PCR amplification, SOS1 cDNA sequences from Arabidopsis (NM126259), Chenopodium quinoa (NM126259), Suaeda japonica (AJ717346), Mesembryanthemum crystallinum (EF207776) Solanum lycopersicum (AJ717346), Oryza sativa (AY785147), and Triticum aestivum (AY326952) were retrieved from NCBI and aligned with the ClustalW program. On the basis of sequence conservation across species, five pairs corresponding degenerate primers were designed. Of these primers, DF2-DR2 (5′-GCTTGTCGTCACTTTCTTCG-3′ and 5′-CM(A+C)CCAAATGCH(A+T+C)TCTAATGC-3’) and DF5-DR4 (5′-TGCTTACTGGGYGATGCT-3′ and 5′-AGYCCCAAAGTACTTCCATG-3′) primer sets produced fragments of the desired size. RNA was extracted from the shoots of S. brachiata using the GITC method. Total RNA (5 μg) was used in RT-PCR reactions and cDNA was synthesised with a Superscript RT II first strand cDNA synthesis kit (Invitrogen, San Diego, CA, USA). The SOS1 gene was amplified in the presence of 10 pmol of the degenerate primers, 2.5 U Taq and 1 μl cDNA according to the following sequence: initial denaturation at 95°C for 2 min, 35 cycles of 94°C for 1 min, 55°C for 1 min, 72°C for 2 min, and an additional 10 min polymerisation step at 72°C. The amplified fragments were purified from agarose gels and cloned into the pGEM-T Easy vector system II (Promega, Madison, Wisconsin) and transformed into DH5α Escherichia coli cells. After sequencing these RT-PCR fragments (1300 bp and 750 bp), four additional primers were designed to amplify the full-length cDNA via rapid amplification of cDNA ends (RACE). The 5′-RACE reaction was performed according to the manufacturer’s protocol (Invitrogen, San Diego, CA, USA). The first strand of cDNA was synthesised with a gene-specific primer GSP R1 (5′-AGAGTCAAGGGGGTTTCAATTC-3′) and Superscript RT II. The mRNA was removed with RNase H, and a homopolymeric tail was added to the 3′-end of the cDNA. PCR amplification was performed using a nested, gene-specific primer GSP R2 (5′-CTACAGCTACAGGATCAGTTGCAC-3′) and a dG-anchor primer AAP (5′-GGCCACGCGTCGACTAGTAC(G)16 -3′). To perform 3′-RACE reactions, the first strand of cDNA was synthesized at the poly (A) mRNA tail with PK1 oligo dT adapter primer (5′-CCAGTGAGCAGAGTGACGAGGACTCGAGCTCAAGC(T)17-3′). Following the first strand of cDNA synthesis, PCR was performed with a gene-specific primer, GSP F1 (5′-AGTAGTAAAGACCAGGCAAGCAAC-3′), and an adaptor primer, PK2 (5′-CCAGTGAGCAGAGTGACG-3′). The 5′- and 3′-RACE products were cloned into a pGEM-T Easy vector. The cloned products of the original PCR and the 5′-and 3′-RACE reactions were sequenced, and contiguous sequences were assembled to obtain the full-length SbSOS1 gene. After determining the open reading frame, the full length SOS1 cDNA was amplified with AccuPrime Pfx DNA polymerase (Invitrogen), using SbSOS F (5′-ATCGGGGTACCATATGGCAGCATCTCGAATTGA-3′) and SbSOS R (5′-ATTCCCCCGGGTCAAGGAGCTTGGCGGAA-3′) primers. The amplification product was then cloned into a pJET1.2/blunt cloning vector (MBI Fermentas) and sequenced by primer walking (Macrogen Inc., Seoul, South Korea). The NCBI database was searched for nucleotide and protein sequences. TMpred online software was used to predict transmembrane domains, and DNAMAN was used to align sequences. Conserved domains in SbSOS1 were identified via the BLASTp program (http://www.ncbi.nlm.nih.gov). ExPASy tools (http://www.expasy.ch/tools/) was used to predict secondary structures. The relationship of SbSOS1 with SOS1 from other plant species was inferred by constructing phylogenetic tree using MEGA Ver. 4.0. The robustness in topology of the phylogenetic tree was assessed based on bootstrap value. Total RNA was isolated from control and NaCl-treated plant samples using GITC buffer and quantified with a Nanodrop spectrophotometer (USA). The cDNA was prepared with 5 μg of total RNA with a Superscript RT II first-strand cDNA synthesis kit (Invitrogen, San Diego, CA, USA). Real Time qPCR was performed in a Bio-Rad IQ5 detection system (Bio-Rad, U.S.A.) with 1x SYBR Green (Sigma, USA). The PCR reactions were carried out in 1x PCR buffer supplemented with 200 μM dNTPs, 1.25 U Taq DNA polymerase and 5 pmol of each gene-specific primer. The PCR reactions were performed under the following conditions: initial denaturation at 95°C for 5 min, 40 cycles at 95°C for 10 sec, 60°C for 30 sec and 72°C for 30 sec. At the end of the PCR cycles, the products were subjected to melt curve analysis to verify the specificity of PCR amplification. The amplified products were electrophoresed through 1.2% agarose gel to verify that they matched the predicted size. Three independent experiments were performed with three replicates each. Fold changes were calculated using the CT method , and CT values for individual variants were compared to those of a reference control (β-tubulin). The SbSOS1-specific primer pair RT F (5′-GGAAGGTTTGGGGATGGTAT-3′) and RT R (5′-GTCCAGCAAGCAAAACCATT-3′) were utilised for expression study of SbSOS1, whereas QBT F (5′-GGAGTCACCGAG GCAGAG-3′) and QBT R (5′-ATCACATATCAGAAACCACAA-3′) primers were used for an internal control. To perform plant transformation, SbSOS1 cDNA was PCR-amplified with AccuPrime Pfx DNA polymerase (Invitrogen) in conjunction with UA F (5′-TAACAGGGCCCATGGCAGCATCTCGAATTGA-3′) and UK R (5′-ATCGGGGTACCTCAAGGAGCTTGGCGGAA-3′) primers, which contained ApaI and KpnI sites, respectively. The digested SbSOS1 gene was cloned as an ApaI/ KpnI fragment into the pRT 100 vector . Thereafter, the entire cassette containing the CaMV 35S constitutive promoter and both the SbSOS1 gene and terminator were cloned into the pCAMBIA2301 vector at the PstI site. The resulting vector was mobilised into Agrobacterium tumefaciens (LBA 4404) and used to transform tobacco (Nicotiana tabacum cv. Xanthi) plants according to a standard protocol . Putative transgenic plants regenerated directly from leaf edges in the presence of kanamycin (50 mg/l) were transferred in jam bottles that contained MS basal medium  supplemented with kanamycin (100 mg/l). The transgenic lines were screened via GUS assay, PCR amplification and semiquantitative PCR analysis. To obtain transgenic T1 seedlings, seeds from the parental plants (T0 seeds) were germinated on kanamycin-supplemented MS medium. Total RNA was isolated from WT and transgenic plant samples using GITC buffer and was quantified with a Nanodrop spectrophotometer (USA). The cDNA was prepared using 5 μg of total RNA with a Superscript RT III first-strand cDNA synthesis kit (Invitrogen, San Diego, CA). The synthesised cDNA (1 μl, diluted 1:5) was used as a template, and actin was used as an internal control for RT-PCR analysis. The SbSOS1-specific primer pair, RT F (5′-GGAAGGTTTGGGGATGGTAT-3′) and RT R (5′-GTCCAGCAAGCAAACCATT-3′), was utilised for expression study of the SbSOS1, whereas QACT F (5′-CGTTTGGATCTTGCTGGTCGT-3′) and QACT R (5′- CAGCAATGCCAGGGAACATAG −3′) primers were used for actin. The PCR reactions were carried out in 1x PCR buffer supplemented with 200 μM dNTPs, 1.25 U Taq DNA polymerase and 5 pmol of each of the gene-specific primers according to the following conditions: an initial denaturation at 95°C for 5 min, 25 cycles at 94°C for 30 sec, 60°C for 30 sec and 72°C for 30 sec, followed by a final extension step at 72°C for 7 min. RT-PCR experiments were repeated three times, and the amplification products were analysed via agarose gel electrophoresis. GUS activity was visualised in leaf tissue with 1 mM 4-methyl-umbelliferyl-b-D-glucuronide as was described by Jefferson . Leaves from control and transgenic plants were cut to 1 cm2 in size and rinsed in 50 mM phosphate buffer (pH 7.0). Leaf sections were then incubated with 1 mM 4-methyl-umbelliferyl-b-D-glucuronide prepared in 50 mM phosphate buffer, vacuum infiltrated for 10 min and then incubated overnight at 37°C in the dark. The tissues were then rinsed with 80% ethanol for 4 h to remove chlorophyll. Genomic DNA was isolated from different T0 lines via the CTAB (N-cetyl-N,N,N-trimethylammonium bromide) method. To verify the presence of the transgene, PCR was conducted with gene-specific primers for real-time PCR (RTF and RTR) and GUS-specific primers (gusA F 5′-GATCGCGAAAACTGTGGAAT-3′ and gusA R 5′-TGAGCGTCGCAGAACATTAC-3′). Leaf discs from WT and two T0 transgenic lines (L1 and L7) were used in the salt tolerance assay. The leaf discs were floated on ¼ MS (control) and different concentrations of NaCl for 15 days. The leaf discs were then homogenised thoroughly in 80% acetone and centrifuged at 3,000 ×g for 2–3 min. The O.D. of each supernatant was recorded at 663 and 645 nm, and the chlorophyll content was calculated per gram of fresh tissue weight . The treatments were conducted under continuous exposure to white light at 25 ± 2°C. To analyse the salt stress tolerance of SbSOS1-overexpressing tobacco plants, the seeds from T0 transgenic plants were germinated in MS medium supplemented with 0, 50, 100, 150, 200, or 300 mM NaCl in culture room conditions. The percentage of seed germination was scored 15 days after seed inoculation. T1 seedlings were also analysed for different growth parameters under salt stress. At eight days, WT and kanamycin-positive T1 seedlings (50 mg/l) were transferred to MS medium supplemented with 0, 100 or 200 mM NaCl in petridish. Shoot length, root length, leaf surface area, fresh weight, dry weight and relative water content (RWC) of the seedlings were measured after 30 days of growth. At one month, WT and kanamycin-positive T1 seedlings were transferred into beakers containing 1/2 MS hydroponic culture and were maintained therein for 20 days prior to receiving stress treatments of 0, 100 or 200 mM NaCl. Leaf, shoot and root tissues were collected 45 days post-treatment and subjected to physiological and biochemical analyses. For ROS analysis 15-day-old WT and kanamycin-positive T1 seedlings were transferred to MS medium supplemented with 0, 100, 200 and 300 mM NaCl in culture jars and maintained for 60 days. In vivo detection of O2− and H2O2 was accomplished by histochemical staining with nitro blue tetrazolium (NBT) and 3, 3′- diaminobenzidine (DAB) as described by Shi et al. . The presence of O2− and H2O2 in transgenic and WT leaves exposed to salt stress was detected by immersing the leaf samples in room temperature solutions of NBT (1 mg ml−1) and DAB (1 mg ml−1, pH 3.8) in 10 mM phosphate buffer (pH 7.8). To detect O2−, immersed leaves were illuminated for 12 h until blue spots appeared, which are indicative of formazan precipitates. To determine the localisation of H2O2, immersed leaves were incubated in the light at room temperature for 24 h until brown spots became visible; these spots occur due to the reaction of DAB with H2O2. Following incubation, the leaf chlorophyll was bleached in absolute ethanol to enable visualisation of the blue and brown spots. O2- content was determined according to Liu et al. . Leaf tissue was extracted in 10 ml of 65 mM potassium phosphate buffer (pH 7.8) and centrifuged at 5,000 ×g for 10 min. The reaction mixture containing 0.9 ml of 65 mM phosphate buffer (pH 7.8), 0.1 ml of 10 mM hydroxylamine hydrochloride, and 1 ml of the extract was incubated at 25°C for 20 min. Then 17 mM sulfanilamide and 7 mM α-naphthylamine were added, further incubated at 25°C for 20 min and the absorbance was read at 530 nm. A standard curve (10–200 nmol) was prepared with NaNO2, to calculate the production rate of O2-. The H2O2 content in leaf samples was measured as described by Mukherjee and Choudhuri . Leaf tissue was extracted with cold acetone to determine the H2O2 levels. 2 ml of the extract was mixed with 0.5 ml of 0.1% titanium dioxide in 20% (v:v) H2SO4 and the mixture was then centrifuged at 6,000 xg for 15 min. The intensity of yellow colour of the supernatant was measured at 415 nm and the concentration of H2O2 was calculated against the standard curve. Free proline content in the leaves was determined using acid ninhydrin as previously described  with minor modifications. Plant tissue (100 mg) was homogenised in 1.2 ml 3% aqueous sulphosalicylic acid and centrifuged at 13000 rpm for 10 min. After centrifugation, 500 μl of supernatant was diluted to 1 ml with distilled water, reacted with 1 ml of 2% ninhydrin in acetone and incubated at 90°C for 1 h. The samples were cooled on ice and 2 ml of toluene was added and vortexed for 2 min. The upper phase was aliquoted to determine absorbance at 520 nm in a T80+ UV–vis spectrophotometer (PG Instruments Ltd., U.K.). Proline content was calculated by comparing the value against a standard curve derived from known concentrations of L-proline (Sigma Aldrich, USA) and expressed as μg/mg of fresh weight. Total soluble sugars were analysed by treating 0.1 ml of the alcoholic extract with 3 ml of freshly prepared anthrone reagent (150 mg anthrone in 100 ml 72% (v/v) H2SO4). This mixture was placed in a boiling water bath for 10 min as described by Irigoyen et al. . After the mixture was cooled, absorbance at 620 nm was measured with a T80+ UV–vis spectrophotometer. A calibration curve was constructed with glucose in the range 20–400 μg/ml (Sigma Aldrich, USA). Total amino acid content was determined as described by Shukla et al. . Specifically, 1 ml of plant extract was treated with 1 ml of 0.2 M citrate buffer (pH 5.0), 1 ml of 80% ethanol and 1 ml ninhydrin (1%), followed by incubation at 95°C for 15 min. The samples were cooled and the absorbance at 570 nm was measured  with a T80+ UV–vis spectrophotometer. Ion content was determined via the method described by Shukla et al. . Plant tissue (0.2 g) was digested in 4 ml of a solution of perchloric and nitric acids (3:1). The solution was dried on a hot plate at 90°C and reconstituted to 25 ml with deionised water before filtration through a 0.2 μm microfiber filter. Xylem sap was collected according to the method described by Olias et al. . The ion content of digested plant tissues (root, stem and leaf) and xylem sap was measured with an inductively coupled plasma optical emission spectrometer (Optima 2000DV, Perkin Elmer, Germany). Each experiment was performed three times and data from 10 plants were recorded. One-way ANOVA with replicates was performed in Microsoft Excel. C.D. values were calculated at P = 0.05 to determine the significance of difference between the means of WT and transgenic plants of each treatment group. Mean values that were significantly different within treatment from each other are indicated by different letters. The SD was calculated to show the variation in the replicates. The cDNA fragment spanning the entire open reading frame of SbSOS1 was cloned and sequenced (GenBank accession number: EU879059). The SbSOS1 cDNA was 3,774 bp long, contained a 90 bp 5′ UTR, a 3,480 bp open reading frame and a 204 bp 3′ UTR region. The cDNA encoded a polypeptide of 1,159 amino acid residues (Additional file 1: Figure S1) with a molecular mass of 128.4 kDa and an isoelectric point of 6.24. Hydrophobicity plot analysis predicted the presence of 11 strong transmembrane helices, beginning with the N-terminus outside and continuing till 447 residues (Additional file 1: Figure S1). The remaining C-terminal amino acid residues included a hydrophilic region and were predicted to reside in the cytoplasm. The SbSOS1 protein sequences were compared with the conserved domain in NCBI database and two conserved regions were identified: Nhap, an Na+/H+ antiporter spanning the transmembrane domain (amino acids 42 to 447) and a cyclic nucleotide-binding domain (cNMP; amino acids 753 to 857) that is located at the C-terminal tail (Figure 1a). The PSIPRED protein structure prediction server was used to predict the secondary structure, which included 55 coils, 45 alpha-helices and 18 beta-strands (Additional file 1: Figure S3). Amino acid alignments of the SbSOS1 sequence revealed a high degree of similarity to Suaeda japonica SjSOS1 (90%), Chenopodium quinoa CqSOS1 (83%), Mesembryanthemum crystallinum McSOS1 (75%), Populus euphratica PeSOS1 (68%), Solanum lycopersicum SlSOS1 (66%), Oryza sativa OsSOS1 (62%), Thellungiella halophila ThSOS1 (61%), Brassica napus BnSOS1 (61%), Triticum aestivum TaSOS1 (60%) and Arabidopsis thaliana AtSOS1 (57%) (Additional file 1: Figure S2). Phylogenetic relationships between these genes were examined by comparing the SbSOS1 protein to 21 other species (Figure 1b), which revealed that SbSOS1 was in close proximity to other halophytes, Suaeda japonica and Chenopodium quinoa at 100 bootstrap values resolving Mesembryanthemum crystallinum at another branch of 99 bootstrap values. Similarly, other members of the cruciferae and poaceae families resolve their members in the same cluster, which is indicative of evolutionary conservation among the members of different families. (a) Schematic diagram showing the transmembrane domains and cyclic nucleotide-binding domain. N and C indicates N-terminal and C-terminal end of the SbSOS1, respectively. (b) The phylogenetic relationship of SbSOS1 with SOS1 from other plant species. The phylogenetic tree was constructed using MEGA ver. 4.0 and the bootstrap values were calculated from 100 replicates and are shown next to branches. The higher bootstrap value signifies resilience in the phylogenetic position of the protein. The scale bar indicates substitutions per site. The protein sequences used for construction of the phylogenetic tree are as follows: Suaeda japonica (BAE95196.1), Chenopodium quinoa (ACN66494.1), Mesembryanthemum crystallinum (ABN04858.1), Limonium gmelinii (ACF05808.1), Ricinus communis (XP_002521897.1), Populus trichocarpa (XP_002315837.1), Vitis vinifera (ACY03274.1), Populus euphratica (ABF60872.1), Zygophyllum xanthoxylum (ACZ57357.1), Solanum lycopersicum (BAL04564.1), Cymodocea nodosa (CAD20320.1), Phragmites australis (BAF41924.1), Oryza sativa Japonica (AAW33875.1), Triticum turgidum (ACB47885.1), Puccinellia tenuiflora (BAK23260.1), Triticum aestivum (CAX83738.1), Brassica napus (ACA50526.1), Lolium perenne (AAY42598.1), Arabidopsis thaliana (AF256224.1), Physcomitrella patens (CAM96566.1) and Thellungiella halophila (BAJ34642.1). To study the expression of SbSOS1, real-time PCR was performed with cDNA from shoot and root tissues. Constitutively expressed SbSOS1 was 4.5 times higher in root tissue than in shoot tissue (Figure 2a). In root tissue, its expression was increased by 7-fold at 100 mM NaCl, relative to 0 mM NaCl; however, SbSOS1 expression remained constant at concentrations above 100 mM that were as high as 2.0 M (Figure 2b). In shoot tissue, SbSOS1 expression increased from 1.5- to 4-fold in response to increasing NaCl concentration (Figure 2c). Real-time PCR analysis of the SbSOS1 gene in response to NaCl stress. (a) The relative expression of the SbSOS1 transcript in root tissue compared with shoot tissue at 0 mM NaCl, (b) the level of SbSOS1 transcript in root tissue at different NaCl concentrations (M), (c) SbSOS1 transcript expression in shoot tissue at different NaCl concentrations (M). The relative expression in root tissue (a) was calculated using the CT value of shoot tissue; in figures b and c, it was calculated using the values for 0 mM salt. The pCAMBIA2301-35S:SbSOS1 construct (Figure 3a) was introduced into tobacco plants for functional validation of SbSOS1 gene. Putative transgenic lines were selected on kanamycin-containing medium and were subsequently verified by GUS analysis (Figure 3f). Seventy individual transgenic lines derived from independent transgenic events were analysed by the GUS assay. GUS-positive plants were subsequently transferred to plastic pots containing garden soil and again to earthen pots after 15 days of hardening. Characterisation of transgenic tobacco plants. (a) Schematic representation of the pCAMBIA2301 - 35S: SbSOS1 construct used to transform tobacco plants with the SbSOS1 gene. (b, c) Verification of transgenic lines via PCR analysis of the SbSOS1 gene with real-time PCR primers and gus-specific primers in T0 plants. (d) Leaf disc assay of WT and transgenic lines (L1 and L7) at different NaCl concentrations in T0 plants. (e) The graph represents the mean and standard deviation (SD) of chlorophyll content in leaf discs of WT and transgenic lines (L1 and L7) at different NaCl concentrations. (f) GUS assay of T1 plants showing positive GUS expression in the transgenic line and negative expression in WT plants. (g) Transcript levels of the SbSOS1 gene in transgenic lines (L1, L7 and L8) and WT T1 plants via semiquantitative RT-PCR. The GUS-positive transgenic lines were further verified by PCR with gene specific real-time PCR primers (RT R and RT F) and gus-specific primers (gusA F and gusA R) (Figure 3b,c). Leaf disc assays were performed to determine the salinity tolerance of T0 transgenic plants. Leaf discs of uniform size from WT and transgenic plants (L1 and L7) were incubated in 0, 100, 200 and 300 mM NaCl. Leaf discs from WT plants began to turn yellow after 9 days and completely bleached after 17 days; in contrast, leaf discs from L1 and L7 plants remained relatively green (Figure 3d). To measure chlorophyll content in WT and transgenic plants, quantitative analyses were performed. The chlorophyll content in WT plants was significantly reduced as a function of increasing salt concentration. Of the two transgenic lines, L7 contained a larger amount of chlorophyll in the NaCl treatment and its chlorophyll content was not significantly affected in 200 and 300 mM NaCl relative to WT plants (Figure 3e). T0 seeds exhibited the expected 3:1 ratio of Kanr/ Kans during germination in kanamycin-containing medium. Three independent T1 transgenic lines were selected on the basis of GUS intensity and were further analysed for transgene expression via semi-quantitative RT-PCR (Figure 3g). To study the effect of salt stress on germination, WT and T0 seeds (L1, L7 and L8) were germinated in MS medium supplemented with 0, 50, 100, 150, 200 or 300 mM NaCl. Upon exposure to higher salt stress, the transgenic seeds exhibited better germination efficiency than WT seeds (Figure 4g). The efficiency of germination was reduced by increasing NaCl concentration for both WT and transgenic seeds (Figure 4a-g). In 300 mM NaCl, neither of the transgenic lines, nor the WT seeds, germinated until 15 days of seed inoculation (Figure 4f). In addition to seed germination assays, the growth of T1 transgenic seedlings exposed to salt stress conditions were also examined (Figure 4h-j). T0 seeds of WT and transgenic tobacco were allowed to germinate in MS medium for 8 days. Subsequently, T1 seedlings were transferred to medium containing 0, 100 or 200 mM NaCl (Figure 4h-j). The T1 transgenic lines exhibited significant enhancements in shoot and root length and leaf area relative to WT plants (Figure 5a-c). The transgenic lines also exhibited significant increases in both fresh and dry weight relative to WT (Figure 5d-e). The L7 transgenic line performed better in response to salt stress in terms leaf area, shoot and root length, relative water content and fresh and dry weight relative to both WT and other transgenic lines (Figure 4h-j, Figure 5a-f). The WT leaves exhibited dehydration in the presence of NaCl, whereas the transgenic lines were better hydrated and possessed higher relative water content (Figure 4h-j). Transgenic lines also exhibited better growth than their WT counterparts when subjected to salt stress in hydroponic culture (Figure 4k-m). Phenotypic comparison of the growth of WT and T1 transgenic lines (L1, L7 and L8) overexpressing the SbSOS1 gene. (a-f) Germination of seeds from transgenic lines (L1, L7 and L8) and WT plants in (a) 0 mM, (b) 50 mM, (c) 100 mM, (d) 150 mM, (e) 200 mM, and (f) 300 mM NaCl. (g) The graph represents the per cent germination of transgenic lines (L1, L7 and L8) and WT plants in 0 mM, 50 mM, 100 mM, 150 mM, and 200 mM NaCl after 15 days. (h-j) Growth comparison of transgenic lines (L1, L7 and L8) and WT T1 seedlings in (h) 0 mM, (i) 100 mM, and (j) 200 mM NaCl. (k-m) Growth of whole plants from transgenic lines (L1, L7 and L8) and WT plants at different NaCl concentrations: (k) 0 mM, (l) 100 mM and (m) 200 mM in hydroponic culture. Comparison of growth parameters of 30-day-old seedlings from transgenic lines (L1, L7 and L8) and WT plants in 0 mM, 100 mM and 200 mM NaCl. (a) shoot length, (b) root length, (c) leaf area, (d) fresh weight, (e) dry weight and (f) relative water content (RWC). Relative to WT plants, the transgenic lines exhibited significantly reduced electrolyte leakage during salt stress (Figure 6a). MSI analyses revealed that the cell membrane of lines L1 and L7 was more stable than WT plants (Figure 6b). 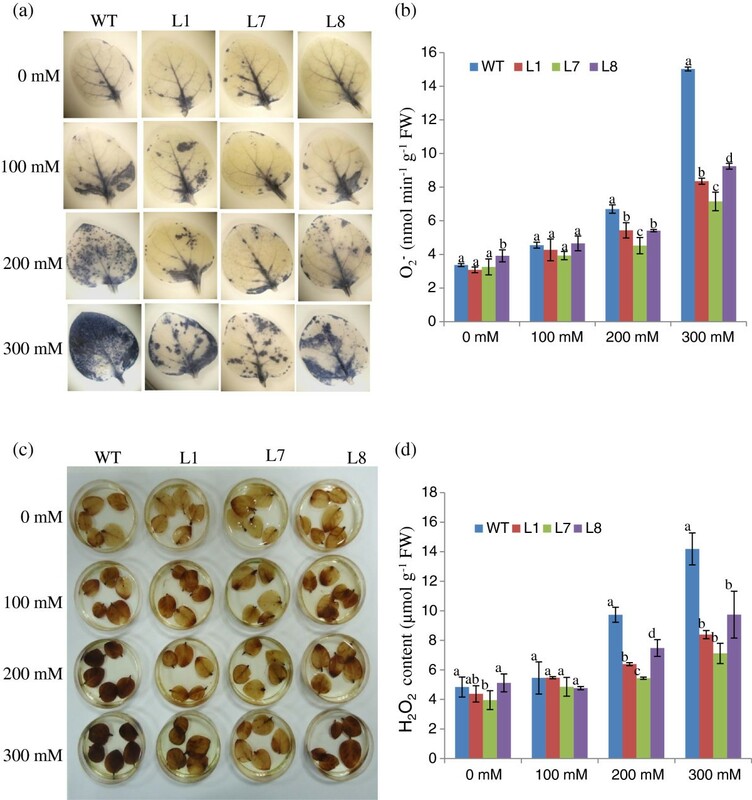 Transgenic lines accumulated less MDA than WT in response to salt stress, which was indicative of reduced oxidative damage in plants overexpressing SbSOS1 (Figure 6c). Electrolyte leakage (a), membrane stability index (b), MDA (c), proline (d), total soluble sugar (e), and amino acid (d) contents of transgenic lines (L1, L7 and L8) and WT plants grown in hydroponic culture with 0 mM, 100 mM, and 200 mM NaCl. Proline, total soluble sugar and amino acid contents were measured in WT and transgenic plants to substantiate the function of the SbSOS1 gene. At 0 mM NaCl, proline content was nearly identical in WT and transgenic plants; however, in the presence of 100 and 200 mM NaCl, the transgenic plants had higher proline content relative to WT (Figure 6d). Transgenic lines and WT both exhibited a gradual accumulation of total soluble sugar by increasing NaCl concentration; however, transgenic lines exhibited accumulation in all treatments that was greater than that of WT (Figure 6e). Whereas the total amino acid content decreased significantly in response to increased NaCl concentration for both WT and transgenic lines, the transgenic lines exhibited a more modest decrease in amino acid content relative to WT treated with 200 mM NaCl (Figure 6f). Control, non-stressed leaves from WT and transgenic plants exhibited similar staining. In contrast, WT leaves exhibited more staining than transgenic lines in the presence of salt (Figure 7a,c). This result demonstrates that WT leaves accumulated more O2− and H2O2 than transgenic lines, confirming that SbSOS1 helps to minimise NaCl-induced oxidative stress in situ. Further these results were confirmed by quantification of O2− and H2O2 accumulation (Figure 7b, d). Both O2− and H2O2 contents were found higher in the WT plants compared to transgenic lines (Figure 7b,d). In vivo localisation and quantification of O 2 − and H 2 O 2 in leaves of 35S - SbSOS1 and WT plants. (a) Localisation of O2− by NBT staining, (b) Quantification of O2− content, (c) Localisation of H2O2 by DAB staining and (d) Quantification of H2O2 content. At 0 mM NaCl (i.e., normal conditions) transgenic and WT plants exhibited approximately equal Na+ content in root, stem and leaf tissues individually. However, in the presence of 100 and 200 mM NaCl; root and leaf tissues exhibited significant reductions in Na+ ion content in all three transgenic lines (L1, L7 and L8) relative to WT plants (Figure 8). However, the accumulation of Na+ ions was found to be significantly higher in stem tissues in transgenic lines compared with WT. In general, stem tissues exhibited a 5-fold increase in Na+ content compared with root and leaf tissues. All transgenic lines exhibited higher concentrations of Na+ than WT in xylem sap under both normal and stress conditions (Figure 9). Na+, K+ and Ca2+ contents in root, shoot and leaf tissues of transgenic lines (L1, L7 and L8) and WT plants grown in hydroponic culture with 0 mM, 100 mM, and 200 mM NaCl. Individual K+/Na+ ratios of different plant organs are also shown in the graphs. Na+, K+ and Ca2+ contents in xylem sap of transgenic lines (L1, L7 and L8) and WT plants grown in hydroponic culture with 0 and 100 mM NaCl. K+ content decreased as a function of increasing NaCl concentration in all tissues in both transgenic and WT plants (Figure 8). However, transgenic lines contained higher K+ content than WT in root, stem and leaf tissues. The maximum accumulation observed in stem tissue was 6-fold greater than that in leaf and root tissues. Transgenic lines and WT plants accumulated equivalent levels of K+ in xylem sap at 100 mM NaCl (Figure 9). Relative to WT, transgenic lines showed an increased K+/Na+ ratio in root and leaf tissues at all NaCl concentrations. In stem tissues, the transgenic lines and WT exhibited ratios that were nearly equal. The transgenic lines showed greater Ca2+ content than WT in both root and stem tissues at both NaCl concentrations (Figure 8). Stem tissues exhibited a 2-fold increase in Ca2+ relative to root and leaf tissues. However, transgenic lines showed a slightly reduced Ca2+ content in leaf tissue relative to WT in stress conditions (Figure 8). Transgenic lines possessed a higher Ca2+ content in xylem sap compared with WT under stress conditions (Figure 9). Salinity impedes plant growth and survival. Plants survive various stresses via mechanisms that operate on the cellular and molecular level. Salt stress can potentially perturb ion equilibrium in the plant system, and antiporters play an important role in adjusting cation concentrations to maintain cellular homeostasis. To avoid the toxic effects of salt, Na+ ions are compartmentalised into vacuoles, or extruded to the apoplast, and remain at low concentrations in the cytosol [50–53]. In response to salt stress, plants maintain high concentrations of K+ and low concentrations of Na+ in the cytosol by regulating the expression and activity of K+ and Na+ transporters and H+ pumps . Until now, few reports have described the in planta overexpression of the SOS1 gene from Arabidopsis[21, 29]; Thellungiella and Puccinellia tenuiflora. Subsequently, a small number of reports have described the SOS1 genes from different plant sources, which were characterised primarily in yeast systems [25, 26, 28, 55, 56]. To elucidate its function in salt tolerance, we have cloned the SbSOS1 gene from the halophyte Salicornia brachiata. The SbSOS1 protein is predicted to contain 11 strong transmembrane regions (TM) at the amino-terminus, and a large cytoplasmic region at the carboxyl terminus (Additional file 1: Figure S1). The N-terminal portion that forms the membrane pore exhibited the greatest sequence homology, whereas C-terminal domains were less similar (Additional file 1: Figure S2). The TM3, TM5, TM8, TM10 and TM11 regions are highly conserved (Additional file 1: Figure S2). Amino acid alignment of SbSOS1 revealed a high degree of similarity to Suaeda japonica SjSOS1, Chenopodium quinoa CqSOS1, Mesembryanthemum crystallinum McSOS1, Populus euphratica PeSOS1, Solanum lycopersicum SlSOS1, Oryza sativa OsSOS1, Thellungiella halophila ThSOS1, Brassica napus BnSOS1, Triticum aestivum TaSOS1 and Arabidopsis thaliana AtSOS1 by 90%, 83%, 75%, 68%, 66%, 62%, 61%, 61%, 60% and 57%, respectively. 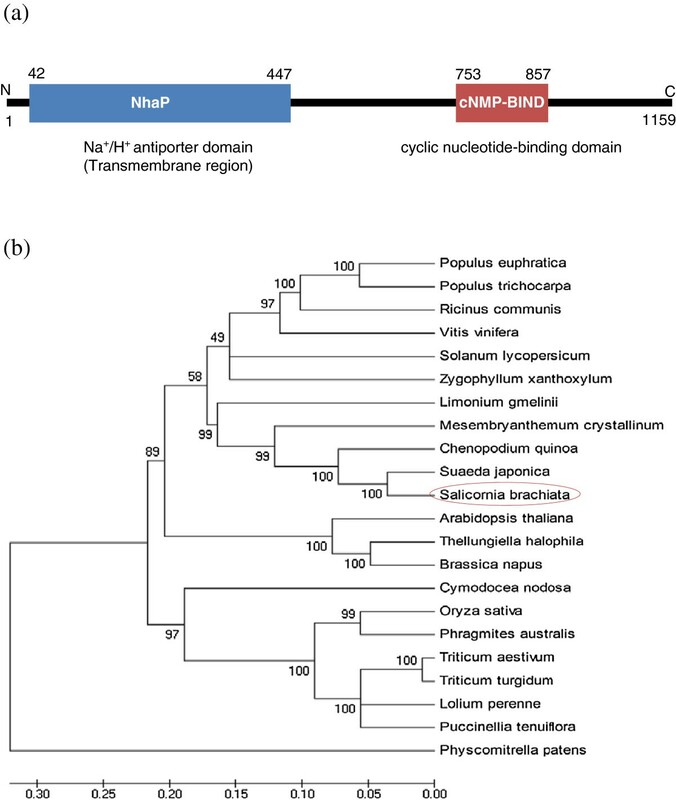 A phylogenetic analysis revealed that SbSOS1 is closely related to Caryophyllales (M. crystallinum, S. japonica, C. quinoa and Limonium gmelinii Kuntze) (Figure 1b). Real-time PCR revealed that the expression of SbSOS1 remained higher in root tissues than in shoot tissues (Figure 2a). Similarly, Kant et al. observed a 7-fold increase in ThSOS1 transcript expression in roots relative to shoots. In shoot tissue, the expression was slightly increased in response to 0.5 M NaCl and increased significantly at higher concentrations. In contrast, even at 100 mM, expression increased by 7-fold in the root and remained constant thereafter (Figure 2b,c). Maughan et al. also observed that SOS1 expression was high at low salt concentration in the root tissue of C. quinoa, which indicates that the SOS1 gene is hyper-inducible in the roots of halophytic plants at even low salt concentrations. Similarly, the SOS1 gene from other plants was expressed more highly in the root in response to salt stress [17, 27]. 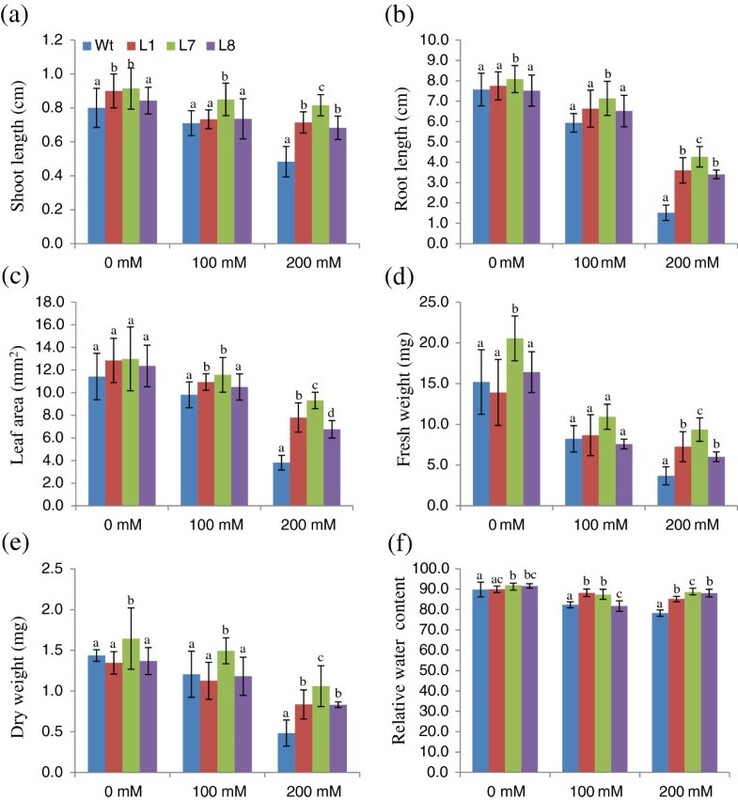 P. euphratica PeSOS1 mRNA remained consistently high in shoot tissue when treated with 200 mM for 0, 24 or 48 h .
Transgenic plants overexpressing SbSOS1 exhibited increased salt tolerance and higher rates of seed germination. Furthermore, in response to salt stress, transgenic plants exhibited increases in root length, shoot length, leaf area, fresh weight, dry weight, relative water content (RWC) and chlorophyll content relative to WT (Figures 3d-e: 4a-j: 5a-f). NaCl also causes the dehydration stress in plants because of the physiological drought stress. Munns and Tester  have mentioned that the salinity stress first causes the rapid osmotic stress followed by slow Na+ stress. The rapid osmotic stress in plants consecutively follows rapid dehydration. Oh et al. studied that Thellungiella Thsos1-RNAi lines were highly salt sensitive and faster Na + accumulating and showed severe water loss in shoots under salt stress and slower removal of Na + from the roots compared with the WT. In the present study, the water retention was found higher in transgenic lines, confirming that SbSOS1 help in water retention during Na + stress to prevent from physiological desiccation. The chlorophyll content was found higher in Arabidopsis transgenic plants than WT in the presence of salt stress. The increase in chlorophyll content indicates that SOS1 transgenic plants have better light harvesting and photosynthetic capacities than WT during salt stress . The morphological features of the transgenic plants were similar to those of WT plants under normal growth conditions. In the present study, transgenic plants experiencing salt stress exhibited low electrolyte leakage and greater cell membrane stability (Figure 6a-b). This observation was corroborated by the reduction in MDA. Analysis of the in vivo localisation of ROS via NBT and DAB revealed that SbSOS1-overexpressing lines maintained less ROS in response to salt treatment, which indicates a reduced potential for oxidative damage resulting from salt stress. Katiyar-Agarwal et al. has reported that SOS1 interacts with RCD 1 (regulator of oxidative stress responses) via its predicted cytoplasmic tail to regulate the expression of ROS-scavenging genes. The relative abundance of proline, total soluble sugar and amino acids are important biochemical indicators of salinity in plants . Proline protects the plants in response to salt stress by regulating the accumulation of usable nitrogen, which contributes to membrane stability and mitigates the disruptive effect of NaCl. Transgenic plants overexpressing SbSOS1 accumulate higher proline than WT plants during salt stress (Figure 6d). Total soluble sugar and amino acids are known to accumulate in plants during salt stress. SbSOS1 transgenic lines accumulated higher levels of total soluble sugar and amino acids relative to WT plants (Figure 6e-f). Soluble sugars help transgenic plants to survive salt stress by regulating osmoregulation and by acting as molecular chaperones that stabilise protein structure . Similarly, the increased accumulation of amino acids suggests a higher rate of protein synthesis in plants experiencing salt stress. Studying ion partitioning in different plant tissues is important to fully understand the function of the transporter genes in that system. Previously, Shi et al. observed that, at 100 mM NaCl, sos1 mutant plants accumulated more Na+ in the shoot and xylem sap than WT, which suggests that SOS1 functions in retrieving Na+ from the xylem stream in response to severe salt stress. Additionally, they overexpressed AtSOS1 in Arabidopsis, which led to a reduced accumulation of Na+ in the shoot and xylem sap at 100 mM NaCl . However, both of these studies were performed in Arabidopsis plants. As described by Olias et al. , Arabidopsis plants limit the precise dissection of the relative content of Na+ in stem vs. leaf; however, the ability to make this distinction is critical in assessing the role of SOS1 in xylem loading/unloading, as well as Na+ export in roots and retention in stems. Therefore, the present study was performed to examine the ion partition in different plant organs by overexpressing the SbSOS1 gene in tobacco, which has more convenient anatomy . Transgenic tobacco plants accumulated lower Na+ content in root and leaf at higher salt stress; in contrast, Na+ content was higher in stem and xylem sap relative to WT, which suggests a role in Na+ loading to xylem from root and leaf tissue. Whereas, Shi et al. suggested that SOS1 function in retrieving Na+ from the xylem stream under severe salt stress, our study supports the hypothesis of Olias et al. , which suggests that the SOS1 functions in Na+ loading to xylem from root and leaf tissues. Potassium is important to the plant system because it plays a role during plant growth and development. In response to NaCl stress, the SbSOS1 transgenic lines showed higher K+ content in root and leaf tissue compared to WT plants. Transgenic lines showed higher ratios of K+/Na+ relative to WT plants in root and leaf tissues at all NaCl concentrations. Even under normal conditions, the transgenic lines exhibited high K+/Na+ ratios. However, in stem tissues, there was no significant difference between transgenic lines and WT plants (Figure 8). Wu et al. showed that sos1 mutants are hypersensitive to Na+ stress and defective in high-affinity K+ uptake; furthermore, these two phenotypes always co-segregated. Shi et al. and Quintero et al. demonstrated that a yeast strain (AXT3K) expressing AtSOS1 accumulated less Na+ and exhibited improved K+ status compared with empty vector controls. It has also been reported that AtSOS1 does not suppress defects of the yeast K+ transport mutant (trk1 trk2)[11, 24, 25] and aids indirect uptake and transport of K+ ions. Accordingly, sos1 mutant plants displaced defective K+ uptake at low external concentrations, and their transport capacity was not altered by overexpression of the SOS1 protein at reduced K+ concentrations. However, Cymodocea SOS1 promoted uptake of K+ in bacteria . Similarly, Wu et al. revealed that PeSOS1-expressing bacteria maintained lower Na+ and higher K+ in the presence of 200 mM NaCl relative to vector alone, which resulted in an increase in the K+/Na+ ratio. Stress and other extracellular stimuli influence intracellular Ca2+ concentration [63, 64]. Ca2+-mediated signal transduction is considered one of the earliest events in salt signalling and plays an essential role in ion homeostasis that permits salt tolerance in plants . The SbSOS1 transgenic lines showed higher Ca2+ content than WT in root and stem tissues at both NaCl concentrations (Figure 8). However, transgenic lines showed slightly lower Ca2+ content in leaf tissues relative to WT plants exposed to salt stress (Figure 8). Transgenic lines exhibited increases in Ca2+ content relative to WT plants in xylem sap at stress conditions (Figure 9). Similar to our studies, Guo et al. proposed a link between Ca2+ transport and SOS1 activity, and also demonstrated that the sos mutant alters the activity of Ca2+ transport systems in both normal and NaCl stress conditions. In WT plants, the Ca2+ influx rate increased after a 5 min treatment with NaCl, resulting in an increase in cytoplasmic Ca2+. During the same time interval, Ca2+ efflux was observed in sos1 mutants, which resulted in a decrease in cytoplasmic Ca2+. The variability of Ca2+ content in the SbSOS1 transgenic lines, compared with WT, can be attributed to changes in Ca2+ transporter activity. Therefore, it is possible that SbSOS1 affects the Ca2+ transporter. In conclusion, the SbSOS1 gene from the extreme halophyte S. brachiata was cloned which showed expression during salt stress. SbSOS1 expression was consistently higher in the root tissue than shoot tissue and was upregulated by salt stress. 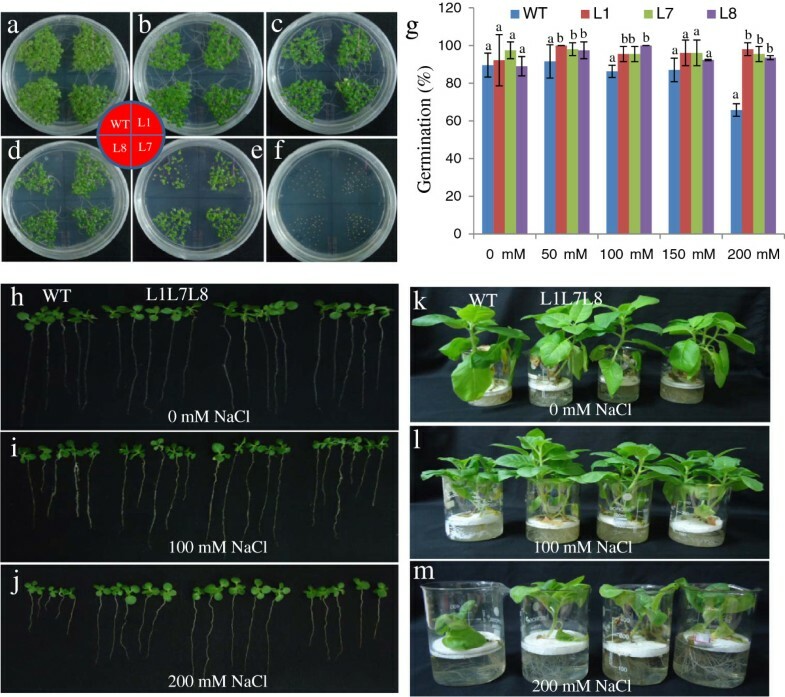 Overexpression of SbSOS1 in tobacco conferred a high degree of salt tolerance, enhanced plant growth and altered physiological and biochemical parameters in response to salt stress. Furthermore, the transgenic lines exhibited lower levels of MDA and ROS accumulation as a result of reduced cytosolic Na+ content and oxidative damage. Transgenic tobacco plants accumulated reduced Na+ content in root and leaf tissues, but higher Na+ content in stem and xylem sap, relative to WT, which resulted from enhanced Na+ loading in xylem from root and leaf tissues. This finding demonstrates that, in addition to the Na+ efflux outside the plasma membrane, SbSOS1 transporter also helps to maintain differing concentrations of Na+ in various organs. 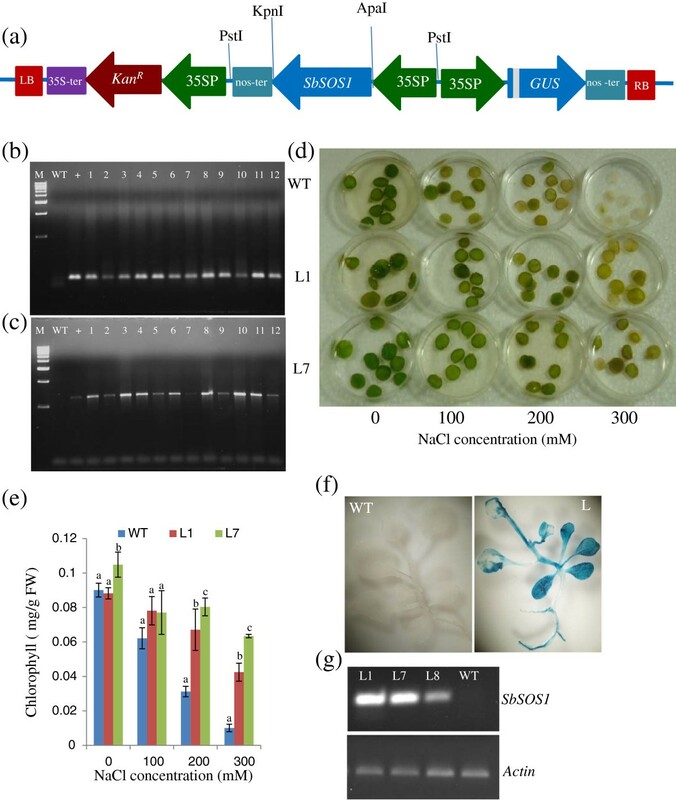 These results support a broader role of SbSOS1 in planta and suggest that this gene can be utilised to develop salt-tolerant transgenic crops in the future. The authors are thankful to DST, New Delhi and Council of Scientific & Industrial Research, New Delhi (NWP-020), for financial assistance. NSY is thankful to CSIR for Senior Research Fellowship. NSY has carried out gene cloning, raised transgenic plants and analyzed them for functional validation. PSS and AJ carried out the biochemical assay of transgenic lines. PKA and BJ designed, coordinated the experiments and finalized MS. All authors read and approved the final manuscript.